Gopher tortoises are a keystone species in Florida. The burrows they make have been shown to be used by nearly 400 species of animals. Far fewer species use these burrows on Sanibel and Captiva but these burrows are essential to their survival. For example, the habitat where gopher tortoises live, uplands, are adapted for fire in southwest Florida. This means that fire is a natural component of the ecosystem. Gopher tortoise burrows act as a refuge for animals during natural fires that start from lightning strikes, and now more commonly controlled burns. 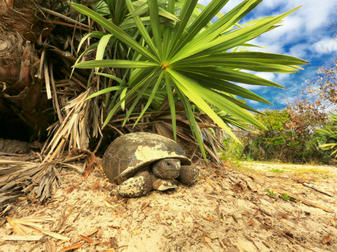 To keep gopher tortoises sustainable on Sanibel, land managers must keep the land hospitable to the species. These tortoises prefer high, open grassy areas. If these areas are not burned on a regular basis, woody hardwoods begin to move in and you lose the diverse groundcover grasses that gopher tortoises depend on for food. We conduct gopher tortoise burrow surveys on our lands annually to assess population numbers of gophers. Over time, we see trends that tell us how we are doing at keeping the uplands as open and diverse as possible. Each year burrows are marked as active, inactive, or abandoned. Through analysis we are able to calculate the estimated tortoises present per acre.